This example demonstrates how you can use ODS to provide links between different parts of your HTML procedure output. This example creates a table where each row contains a link to another table with more information about that row. All destinations are first closed to avoid generating the output multiple times. ODS writes the HTML output to the file anovab.htm. The ANCHOR= option specifies anova1 as the root name for the HTML anchor tags. This means that within the HTML document, the URL for the first table will be anova1, the URL for the second table will be anova2, and so on. This template uses the CELLSTYLE statement to alter the values in the Source column ('Supplier' and 'Machine') of the ANOVA tests table. The values of 'Supplier' and 'Machine' are displayed as hyperlinks in the HTML, and clicking them takes you to the links anova2 and anova3, which are the multiple-comparison tables. You can find the value to use in the URL by viewing the HTML source file, anovab.htm. You can either open the HTML file in a text editor or view it in a browser window and select View Source. Search for '<a name=' to find the URL names. The first table is anova1, the second is anova2, the third is anova3, and so on. If the ANCHOR= option had not been used in the ODS HTML statement, the names would have been IDX, IDX1, IDX2, and so on. If you do not use the ODS SELECT statement or if you do anything to change the tables that are produced, the names will be different. 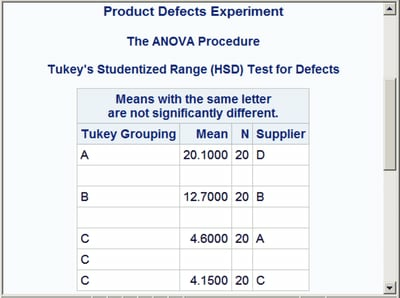 The statements create the Supplier label as a link that enables you to open the table of means from the “Tukey’s Studentized Range Test for Defects” associated with the Supplier variable. Similarly, Machine provides a link to the table of means from the “Tukey’s Studentized Range Test for Defects” associated with the Machine variable. 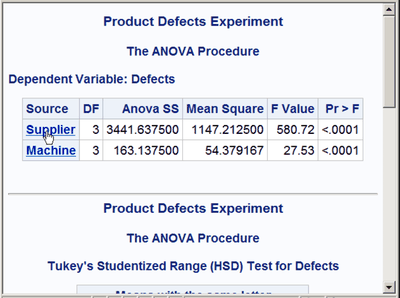 The ANOVA table is displayed in Output 20.8.2. The underlined text displayed in Output 20.8.2 shows the links, Supplier and Machine, that you created with the modified template. When you click a link, the appropriate multiple-comparison table opens in your browser. Output 20.8.3 shows the table from the Supplier link. These statements produce Output 20.8.4.